A graph database is not only a simple way to store connected data, it is also a powerful tool to manage dynamic relationships between data. 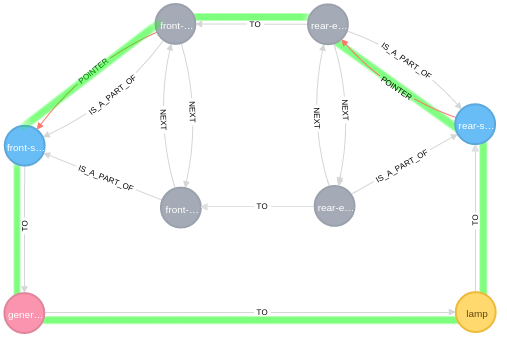 Since relationships are natively implemented in Neo4j, we can use them as a simple way to identify a group of connected nodes. But it is not the only usage we can make of them. 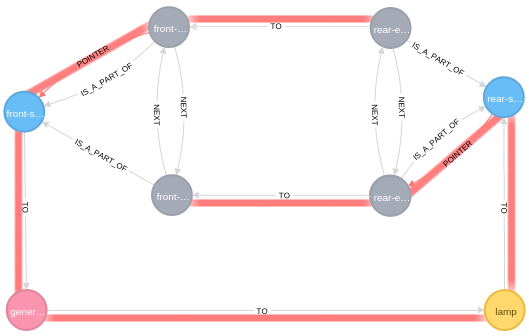 There are many use cases where consecutive queries can move the relationships between nodes. 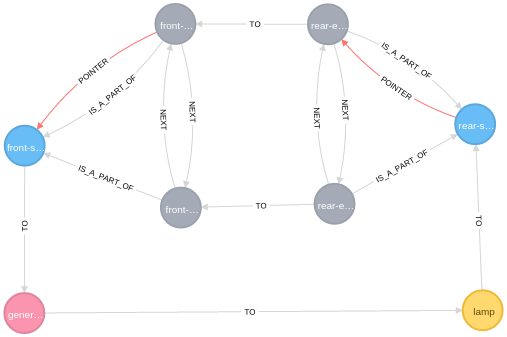 These relationships are intended to store a particular state for a sub graph like a pointer for example. Let’s have a closer look. To observe this behavior, our first example is the famous Linked List. A linked list is a list where each item is ordered according to its relative position compared to the others items. On each call, the currently pointed element is returned and then the pointer moves to the next element (like in Java with the Iterator object iterator ().next () ). 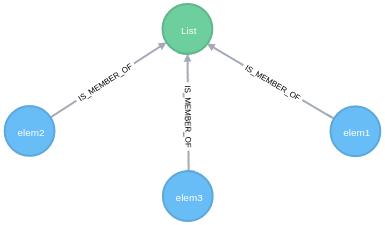 First we need to create a :LIST node with three :ELEMENT nodes linked to it. Here we use a loop (the first FOREACH clause) to browse the collection of elements and to create a relationship between the previous node and the next node. If you need more explanations about this query, you can find a very interesting post from Mark Needham here: Neo4j: Cypher – Creating relationships between a collection of nodes. Now, we have to write a typical query which returns the current pointed element and emulates the pointer movement. As we can see, the nature of each relationship type is different. The first two ones have a long lifecycle (as long as the list exists) and the last one has another function: its lifetime may be short because it is only a volatile state at any given moment. This is a moving relationship! Yes, it is a weird title and a strange use case. I think that it is interesting to introduce another way of thinking about data relationships. Previously we were talking about a relationship as a pointer, now we have to consider combined states. And the best example to introduce this notion is the electrical three-way switch. In the hallway of your house, you need to switch the light on or off from more than one location. You have to be able to switch the light on from the entrance (front switch) and to switch it off from the other end (rear switch), since it wouldn’t make sense to turn the light on only from the last place where you turned it off. Figure 5. A three-way switch. Image source. Very well, but what is the link with graphs? In the domain of electricity, switching the light on requires a closed circuit. In graph theory, a closed circuit is called a cycle, meaning that it should be possible to easily convert it into a graph. If we can detect a cycle through these elements we can deduct that the lamp is on, whereas if we cannot find a closed cycle, the light remains off. Figure 6. The first adaptation. The TO relationships represent the electrical wires. The POINTER relationships represent the current states of the switches. But this graph isn’t sufficient, because we can’t find the next Endpoint from the currently pointed position. We need to build a circular linked list around the endpoints for each switch. 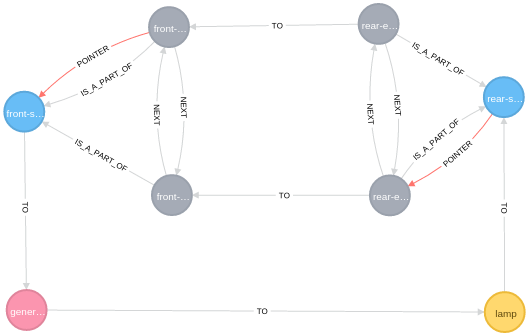 Note that the last query line MERGE beginning<-[:NEXT]-ending is useful to link the last element to the first and thus to obtain a circular reference. Figure 7. The second adaptation. Figure 8. A broken path. When a user toggles the rear switch to turn on the light, it triggers the query below. Figure 9. Touching the rear switch. The rear switch pointer moves from its initial position to the second one and thus closes the path between the lamp and the generator. Figure 10. A closed path. The result would be the same with the front switch, since we emulated a three-way switch. It is a good starting point for home automation applications, isn't it? Imagine a graph that stores all the positions of lamps, doors, gates or shutters of your house...and then, more complex graphs to manage an entire building (i.e., facility management)! You can also try to obtain the same results in SQL, but I expect this to be challenging. Note that our representation is simplified on purpose. A switch could be modeled using a pre-defined component with three endpoints (one input and two outputs). If so, we could model a graph composed of combinations of components (with internal states) rather than composed of combinations of unitary nodes, but that is another story. As we can see, there are different natures of data relationships: Some of them have a permanent life, like the electrical wires in our previous example; some of them, like pointers, have a lifecycle and are supposed to store a state. The latter are the ones I call moving relationships. Special thanks to Patricia for reviewing. 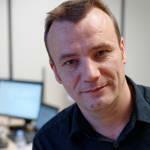 Editor's note: Sylvain Roussy is also the author of the French ebook introduction to graph databases and Neo4j, and he'll be publishing a new edition in December with an update for Neo4j 2.3. I had two doubts in queries written above..
a) for multiple MATCH statements you have not used WITH in between them, is that no longer necessary in future versions or u have just omitted it for ease of writing here? b) For lamp check query, I don’t think loop has been completed the way you have written. to check for completeness of circle? or am I missing something here?? Above comment seem to have been messed up by whatever auto checker or editor this site seem to have. a) Yes, it was for ease of writing that I wrote the queries this way, which can indeed potentially lead to Cartesian products. I wanted to demonstrate a concept without regard to performances at this stage (no indexes too). b) You are right but in this example I consider that the direct relationship between the Generator node and the Lamp node always exists (to simplify). Hi, thanks for a great blog. However, I have a query. i.e. from a .csv file. How can it be achieved? In closing, you state: “A switch could be modeled using a pre-defined component with three endpoints (one input and two outputs).” As opposed to the solution that you posted in the article. Could you please post an example of what that would look like? 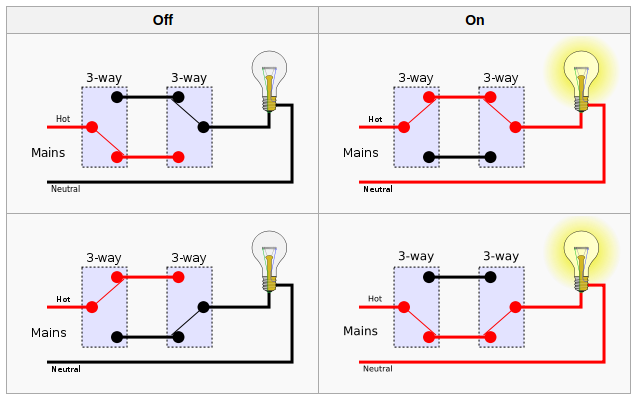 And use this query each time you place a switch on a electrical plan (via graphical UI for exemple). Then, you can also imagine other type of pre-defined queries for components and thinking your graph at high level (Hypergraph ?). Like Tactical compared to Strategy are. Normally relationships may have properties. How to move a relationship with properties from one node to another node keeping the properties? I cannot see a way to do this in one step (one cypher query). Are I am missing any code or function to setup?